When you smell blueberry pie, you might experience warm, sentimental feelings as you remember eating dessert with your loved ones at a family gathering, around the dinner table. One slice, or one-sixth of an 8-inch pie, contains 271 calories. The calorie count would be higher if the pie is served with ice cream. 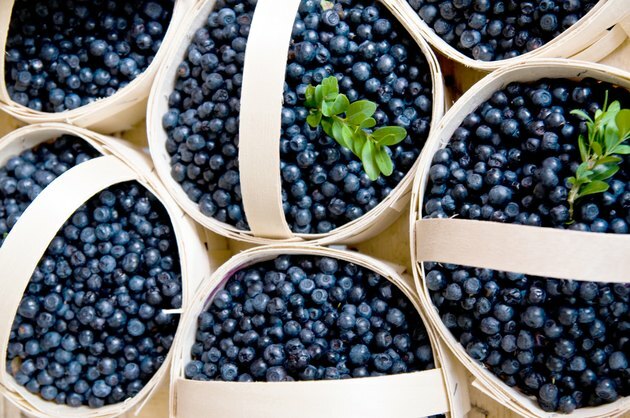 Blueberry pie is rich in carbohydrates in the form of sugars. Carbohydrates contribute 163 calories in one slice of an 8-inch-diameter blueberry pie, or about 59 percent of the total calorie content. Of these calories, 46 are from sugar alone. Fat contributes 105 calories, which is a little less than 39 percent of the total calorie count. Only 8 calories, or about 3 percent of the total calorie count, in a slice of blueberry pie come from protein.